Book Review: John H. Walton. 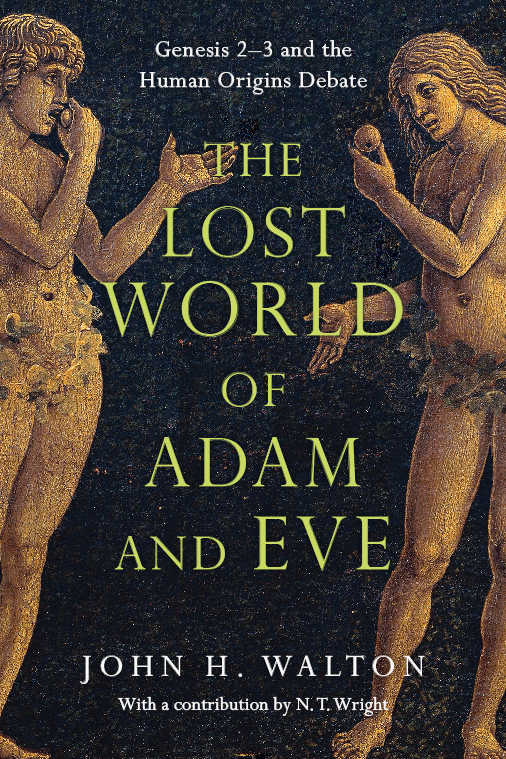 The Lost World of Adam and Eve: Genesis 2–3 and the Human Origins Debate, Downers Grove: IVP Academic, 2015. Kindle edition. Thoughtful readers of the opening chapters of Genesis have long wrestled with not only internally difficult passages, but also with how these chapters relate to developments in science. Resultantly, interpretations of the world of Adam and Eve and its significance to contemporary Christianity have produced wildly different conclusions ranging from the overly simplistic to various forms of concordism that do obvious violence to a biblical worldview and to the stability of the text. In this excellent volume, John H. Walton has provided an intriguing study of these passages and the difficulties involved that deserves careful attention and consideration. Walton, professor of Old Testament at Wheaton College and Graduate School, sets forth a fascinating set of propositions that aims for the very thing that is most often missing in this discussion, namely, the need to read these chapters of Genesis primarily in their Ancient Near Eastern (ANE) context. His presentation is lucid, thoughtful, and challenging, and this text should be read by all interested in this topic. But be warned; this is not light reading, and, if you are an Evangelical, as I am, you are likely to have one or more of your cherished understandings of Gen. 2–3 challenged. Perhaps the most promising aspect of this text lies in its methodology. Walton, though interested in how the biblical text comports with science and modern thought, does not take an approach that seeks to harmonize Scripture with scientific developments. Rather, his primary concern is rightly to advance an understanding of the Genesis narrative that finds its hermeneutical guide in its own ANE context. As such, he concludes for instance, that Genesis is an account of “functional origins, not material origins,” (Proposition 3). That is, “the seven day origins account in Genesis is a ‘home story’; it is not a ‘house story.’” He does this, as he does throughout this text, by looking first to the biblical text, and second to other ANE literature to better understand how various images and ideas functioned in that cultural context. Interestingly, though Walton, like others, finds parallels with other ancient texts, he also shows how the biblical text often comes to vastly different conclusions about the world, humanity, and God than do many of the contemporary ANE pieces of literature. Thus, Walton has shown that one of the goals of the Genesis account is to present a direct challenge to then prevailing notions about human relationships both to each other and to their Creator, and in relation to the theme of order and chaos. That means that these names are not just a matter of historical reporting, as if their names just happened to be Adam and Eve like someone else’s name is Bill or Mary. Although I believe that Adam and Eve are historical personages––real people in a real past––these cannot be their historical names. The names are Hebrew, and there is no Hebrew at the point in time when Adam and Eve lived. Though such concepts may be at first somewhat difficult for some to swallow, that difficulty most often lies in the tendency to read Genesis through our own cultural lens and conceptual categories. This is the very thing that Walton seeks to overcome, and he does it in a very thorough and convincing way. My only criticism of this text, even though I don’t always agree with all of his conclusions (I do find them all at least worth considering though) is that there are times when I think he fails to give adequate attention to the notion of progressive revelation, and consequently leaves certain key canonical questions unresolved. While I think Walton is correct to say that ancient Israelites would not have interpreted the serpent as referring to Satan, an idea that awaits further development in salvation history, it seems he could have done more for the reader in clarifying his view regarding how contemporary believers should understand this element of the story in light of New Testament (NT) passages that do make this connection (Rom. 16:20; Rev. 12:9; 20:2). Walton does note the NT development, but in my view, could have done more to aid the reader in how to best interpret the relationship between the OT and NT understanding. In conclusion, this is one of the most exciting books I’ve read on this subject, and provides some of the most reasonable resolutions to difficult issues in Gen. 2–3 that are biblically faithful, grounded in sound exegesis, and thoughtfully considerate of ANE literature and imagery. Not to mention, the book also contains an excellent excursus by N. T. Wright on Paul’s use of Adam. Thus, I suspect that this text will be a central feature in future discussions about how to understand not only the Genesis account of Adam and Eve, but also Pauline interpretation of these important passages.